This is a project I made at the Sunday International booth Saturday. Michelle, a real sweetie, taught this. We used a 4 1/4" x 11" piece of cardstock, scored it in 5 places, folded, and punched holes. This would be great stamped with maybe Fancy Curls or some swirl set that TAC carries. The large flower is acrylic with small punched holes. We colored it using Brilliance Dewdrops and heat set. We pierced the paper before using the large brad to attach. I added a "rhinestone" to the center of the brad for bling. The flowers on the side is a sticker. This is a real cute idea for a gift bag. This is the Bind-It-All bag that I purchased for my tool. I paid $30 + tax but now that it's no longer in the shipping box I may use it more! The Bind-It-All fits real nice with lots of pockets for accessories, but you cannot fit the boxes of wires in this, only little sections. The Expo was a bit of a disappointment. There were many non-stamp/scrapbook related booths such as salsa, coffee, Tastefully Simple, Bras & Underwear (recommended by Oprah), home decor, flute players, and jewelry. I did buy a small can of Caramel Mochaccino Instant Gourmet Coffee from the Frog Hollow Coffee booth but I think I can make my own much cheaper version using my Faux Cappachino recipe. Stamp booths that I remember are: Denami, Rubber Necker, Sunday International, Cricut, Endless Creations, StampinUp, Close to my Heart, Creative Memories, Accent Scrapbooking, Sizzix, and many smaller companies. I already threw away my program so I no longer have the complete list. Besides the bag shown I purchased a Versamagic Cloud White ink pad, some Stickles, a 2 3/4" scallop circle punch by Punch Bunch ($20), and a cute (wood mounted) stamp of a Saguaro cactus with the word Arizona under it to use on my envelopes. I hope to play with some of these items after I get back from Curves today. 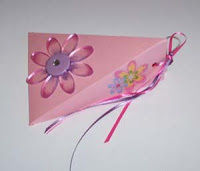 I will post the cards I make, some here and some on my StampingCarol website. Catch you all later! !